Four of these numbers are clearly good news for the business. The last one isn't. Netflix's (NASDAQ:NFLX) first-quarter results contained plenty of good news for investors. The internet TV leader turned in surprisingly strong growth on both its top and bottom lines as it sailed past management's big-picture forecasts. Below we'll look at some visual highlights from the period. The streaming giant added 7.4 million subscribers during the period to outpace management's guidance by more than 1 million users. Those gains came even as average monthly prices rose 14% thanks to increased fees and the continued migration toward high-definition and multi-stream plans. As a result, Netflix's sales grew to $3.6 billion, or up 43% year over year. That's the company's fastest growth since it shifted into the streaming-video business. Management's second-quarter forecast calls for another record as sales are projected to rise 44% to $3.8 billion. International earnings, in millions. Data source: Netflix. Chart by author. *Q2 2018 is management's forecast. Back in late January, Netflix estimated that the international segment would contribute $234 million toward earnings. The actual result was $272 million. As a group, these territories have now matured enough to be solidly profitable, with recent gains easily offsetting initial losses from the early international rollout. In an indication of the increasingly global focus of the company, Netflix believes 5 million of the 6.2 million users it expects to add next quarter will be located outside the United States. Fiscal 2015 and 2016 were investment years that included expenses from the international rollout and heavy spending on exclusive content. CEO Reed Hastings and his team aimed to begin pushing operating margin back up starting in 2017, and they succeeded by lifting profitability to 7% from 4%. Their initial forecast aimed for a further 3-percentage-point improvement in 2018, but that goal was revised upward slightly to between 10% and 11%. Netflix's long-run margin potential is a function of how big the company can grow, and whether it can convince its users to spend more time within its service. "We're a fraction of the hours of viewing of YouTube [and] a fraction of the hours of viewing of linear TV," Hastings said in the quarterly conference call, adding, "[W]e have a long way to go in terms of earning all the viewing that we want to." Netflix spent significantly less than it projected on content this quarter, and that was one big reason profits shot up so much higher than expected. The modest spending was just a timing issue, though, and the company still expects to spend as much as $8 billion on TV shows and movies this year. A disproportionate amount of that cash will be allocated in the second half of the year. The company is testing heavier marketing around these show releases, too, on the theory that they'll have a better chance at becoming valuable assets if Netflix can build buzz around them through more aggressive means than just showcasing them within its app. 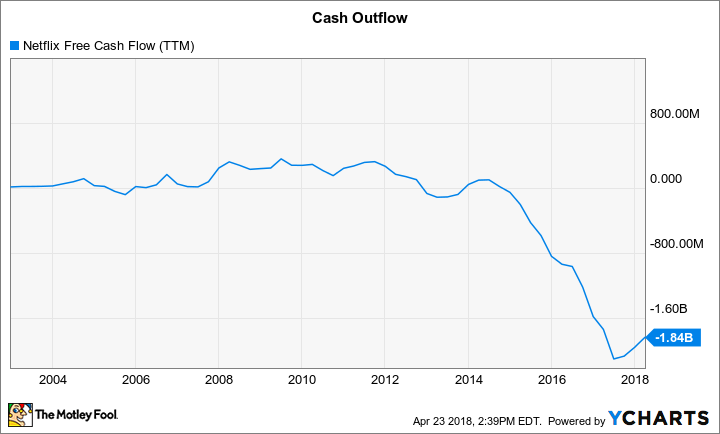 NFLX Free Cash Flow (TTM) data by YCharts. Investors shouldn't read much into the fact that cash burn improved to $287 million from $524 million in the prior quarter. Content release timing formed the basis for that change, and Netflix still expects to part with $3 billion to $4 billion of cash in 2018, or as much as double the prior year's $2 billion outflow. 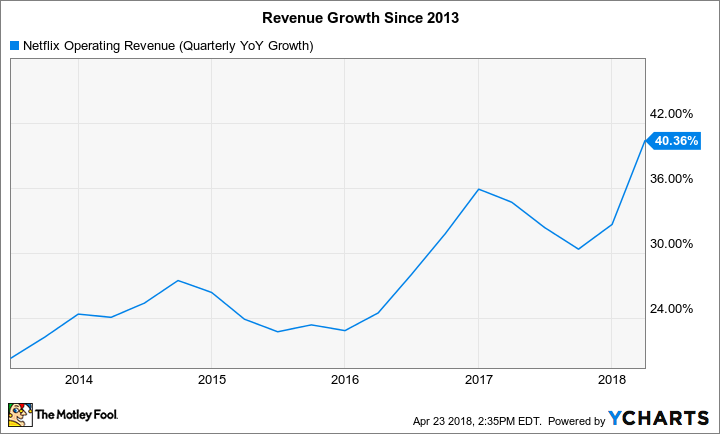 It's too early to say whether this year will mark the peak of cash losses, but management believes that the combination of rising profitability and slowing growth in original content spending will eventually push the business into positive cash flow. Netflix has good reasons to stay bold in this arena. Its original-content investments are helping spur accelerating user growth and increased engagement by existing members. Those wins suggest its global growth story could just be in the early stages.